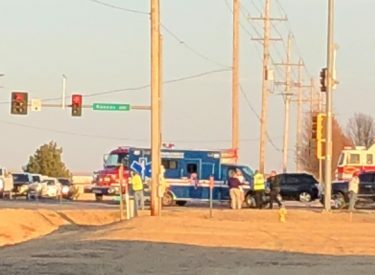 On Tuesday, December 19, 2017 at about 4:45 p.m., emergency responders were dispatched to the intersection of Kansas Avenue and Tucker Road for a reported traffic accident. Responding officers found two vehicles were involved. Investigating officers found that a 42 year old female was driving a 2013 Ford Edge. The vehicle was turning left to go west on Tucker Road from Kansas Avenue. A 26 year old male was driving a 2016 Cadillac Escalade south on Kansas Avenue when it was struck by the Ford Edge in the intersection. Both drivers stated a paint striping vehicle obstructed the view of the intersection. No injuries were reported. Both vehicles were towed from the scene because of functional damage.